Last fall, the American Association of Pediatrics (AAP) finally backed down from their killjoy ‘screen time’ rules that had deprived countless kids of the freedom to pursue their interests and explore digital worlds. No screens in the first 2 years, no more than 2 hours a day. After pushing their famous 2×2 rule for almost two decades, now they advocate against a one-size-fits-all approach and suggest that parents can be ‘media mentors’ and not just time cops. But damage has been done. For almost as long as the AAP 2×2 rules have been in place, I’ve been studying how multimedia, digital games, and the Internet can fuel extraordinary forms of learning and mobilization. Young people are growing up in a new era of information abundance where they can google anything and connect with specialized expert communities online. However, our research also indicates that most kids are not truly tapping the power of online learning. In part I blame the 2×2 guidelines for holding kids back, and putting parents in the role of policing rather than coaching media engagement. By focusing on quality over quantity, families can move away from fear, maintain a healthy balance, and seek out extraordinary learning. 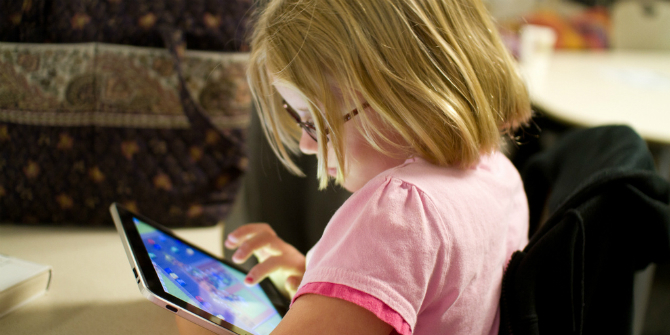 The idea that screens are bad for kids has gotten deeply entrenched. Parents worry about video game addiction, are plagued with guilt when they park their kid with a tablet, and judge mothers who bring Pokémon Go to ‘the sanctuary of the playground’. Many parents pride themselves on following the old AAP guidelines; clocking screen time, believing this will lead to healthy kids. It’s natural to hope that controlling access to a device might make our kids smart and well-adjusted, but if only it were that simple. Maybe it made more sense when TV was the only screen, but given the wide range of activities that screens are part of these days, a focus on screen time is too blunt an instrument. My daughter taught me this lesson when she was twelve. One summer, I was irritated with the hours she was spending watching TV shows on YouTube. After I started clocking her screen time, she quickly developed a strategy. She would use her limited screen time on what I considered the most inane uses of the computer and I would inevitably give her more time for more “productive” screen activities like learning new skills or creating digital media. I eventually backed down and we installed Rescue Time on her computer, which tracks time on specific applications and websites. Rather than simply clocking time spent with screens, we started reflecting together on productivity and time management, a conversation that continues to this day even as she has left home to study overseas. Based on an extensive study of digital parenting, Alicia Blum-Ross and Sonia Livingstone conclude that instead of quantity, parents needs to focus on ‘context (where, when and how digital media are accessed), content (what is being watched or used) and connections (whether and how relationships are facilitated or impeded)’. Here are three ways to put this recommendation into action by letting go of fear, maintaining balance and hunting for extraordinary learning. Fears about the negatives of media engagement are real, but only for a minority of families. When I give talks about learning with digital media, occasionally a parent will stand up and tell a gut-wrenching story about cyberbullying or video game addiction that strikes fear in the hearts of parents in the room. They speak passionately about how important it was for them to pull the plug or set strict limits to nurture their child back to safety and health. These are deeply troubling, important, and unusual experiences. Even the conservative AAP puts ‘problematic’ forms of Internet and gaming use at between 4%-8.5% of U.S. children and youth. This is a significant minority, and parents do need to be alert to warning signs. Some kids have a harder time setting limits to digital engagements, and the online world can also become a place for them to escape from problems in their face-to-face relationships. These families need to take a hard look at social media, games and the Internet not because they ‘cause’ these problems, but because they can amplify psychological and social distress. Solutions might include limiting gaming and social media, but should take into account the bigger picture which includes peer, family and other psychological and social factors. Simply limiting screen time without addressing deeper problems is not likely to lead to positive outcomes. Even for problematic digital engagement, strict screen time rules, monitoring and surveillance are not always the best strategies, which is why even the AAP has moved away from them. In fact, being fearful, restrictive and controlling of kids’ media use can backfire as it breeds a climate of mistrust, and kids learn to operate in secrecy. Teens generally describe parental surveillance as one of the biggest threats to their online privacy. Recent research shows that most parents do not have major fears and concerns about their kids’ media engagement, and are heavily engaged in media themselves. Common Sense Media reports that parents engage with media at similar rates as their tween and teen kids (over nine hours a day! ), and don’t have the right to call the kettle black. The same report indicates that the overwhelming majority of parents feel that they are good media role models, and that digital and online media play a positive role in education and skill development. This approach is similar to what Common Sense Media advocates as a ‘healthy family media diet’. Most parents I hear from are not only relieved, but enthused to find a youth development ‘expert’ and parent who thinks the Internet can be good for kids, because it conforms to their own experience. After every talk I give, a parent or a teacher will share a story about how the Internet supported unique forms of learning for a child they know, whether that is a kid learning to write through online fan fiction, or how an online game exposed them to a new dimension of collaborative problem solving. But why settle for a balanced diet when you can have an extraordinary meal? Balance is important over the long term but sometimes passion should rule the day–the state Mihaly Csikszentmihalyi has described as ‘flow’ when one loses track of time while being completely immersed in a learning challenge. In my research, I’ve marveled over kids who are learning to code at younger and younger ages, have organized social media movements, or produce and distribute fan media for massive audiences. Check out this jaw-dropping video of an extraordinary young girl who mastered a niche form of dance by immersing herself in YouTube videos. The Internet has helped fuel thousands of passionate learners like dubstepping Adilyn, an emerging new type of Internet-powered expert. We founded Connected Camps because Minecraft is a platform, like YouTube, where young people are connecting, creating, and learning from one another, tapping tools for digital creation and sharing, exploring new niches and nerding out in specialities that they would not otherwise have access to. I’m constantly awestruck at the massive artworks, role playing games, and organizations that young kids have built together in our Minecraft community. Just like the X-Games is an umbrella for a vast diversity of incomparable athletes in breathtaking specialties, Minecraft and the Internet are fueling highly idiosyncratic forms of creativity, expertise, mobilization and self expression. Finding a groove isn’t easy, and not every kid will dive into something with a singular passion. But the potential is there for online media and digital games to support just about every interest and curiosity under the sun. Even if it is just an amusing meme, a factoid, or a coding with Minecraft, without exposure and parental support, kids will not have the freedom, wisdom, or courage to explore and savor the vastness of the networked world. So let go of fear and join the hunt for extraordinary learning. This text was originally published on Connected Camps and has been re-posted with permission.